This weekend we kicked off our 6th annual 2017 Thrifting Atlanta Fashion Week. Our kick-off event was an Awards Luncheon and Fashion Show. Over 100 of Atlanta's thrift fashionistas attended the event to celebrate our vibrant Thrifting Atlanta community. Click HERE for a photo recap of our event. I wore this beautiful neon yellow scuba dress. I bought it from Goodwill of North Georgia Decatur location. Can you believe this dress was only $7. Although I would like to take all the credit for finding this dress, my thrift sister Wendy of Just Jewels 4 U, is the true winner. She actually saw it first and then I begged her for it. She was such a doll for letting me have it. Then a week later, I scored the Steve Madden Carrson Glitter Heels from Uptown Cheapskate in Johns Creek, They retail for $39. My price $16. Neon is one of the hottest trends for Spring/Summer 2017. This is one of the reasons I knew I had to have this dress. Plus the color and fit were a perfect compliment too. Want more spring dress inspiration? Check out the Trend Spin linkup with Laura of Walking in Memphis in High Heels, Megan of Pretty in Pink Megan and Erin at The Fashion Canvas. Do you plan on adding the neon trend to your Summer wardrobe? Super cute dress and shoes!! I love that bright, vibrant color! It looks great on you! Definitely perfect for spring and summer! That color is beautiful! I love the cut of this dress, it's short but not too short, and it goes perfectly with those shoes! That color looks amazing on you! And glitter heels?!?! Umm yes please! Those are absolutely fabulous! I bow to you, o shopping goddess!! What a wonderful outfit! You inspire me! You look great! I love your dress - neon yellow is a happy color! And those shoes are to die for. I love shopping at Goodwill, you never know what hidden treasures you will find! I love the whole outfit but I especially love the shoes. They look like the perfect New Years shoes! This is a great spring outfit! That dress is perfect for Spring! I love the color and the shoes are perfect with it. I can't believe at how cheap you got it! It's awesome! That dress is an awesome find! It's nice that your friend gave way so that you can have it. I think it's lovely and I love the way you styled it as well. I love that dress!!! And those shoes are gorgeous! I love all of this!! So perfectly paired! I also love the scuba dress b/c it works for every body type! Oh My!! That yellow dress is a killer. Love it. It suits you so very well. love love love the dress and the fact that it is a thrift store find. WHAT?!?!?!? that is crazy good! You look stunning. 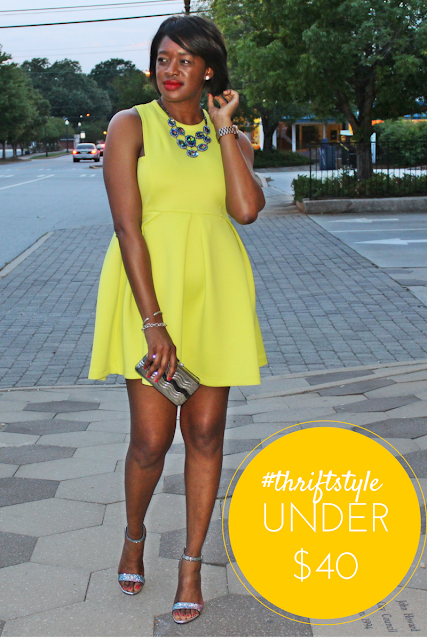 That yellow scuba dress is a standout and those glitter heels are amazing. I really need to do some thrift store shopping next time I visit Atlanta. Girl!! I am SO obsessed with this dress. Gorgeous. Those heels are sooo cute, too. I am loving this dress! It is so bright and pretty! It really gives a statement of confidence! Nice dress! And kudos to you for wearing yellow. I don't think it would work for me. Yellow is not my color, but it sure looks good on you. And for under 40 bucks, you can't beat that! I love your dress but love you shoes even more! Glitter is perfect! They look great together. Omg that is one fabulous dress!!!! That color really pops. Perfect for spring and summer that's for sure. Love the neon color of the dress! So impressive that you're able to find something this cute at such a low price point in the thrift store. This is inspiring me to hit up our local store! Very cute dress! You wear it so well! I look terrible in neon colors and it really washes me out, but this neon yellow scuba looks fabulous on you! I love the Steve Madden glitter heels. Any outfit that you can add a little bling too always looks great.